Fall is a great time of the year, with so many distinct sights, smells, tastes and textures. I love the tastes of fall, with all the fragrant spices and hearty textures. Butternut squash soup, pumpkin bread, apple pie, beans with molasses and gingerbread make my mouth water! Gingerbread and other spice cookies are super-yummy, but I never make them, because honestly, I find it so tedious to measure out all those spices -- plus I have to buy so many spices and store them in my cupboard, where they'll probably sit unused until I have to throw them out. Enter Bettey Crocker Molasses Cookie mix, which is a wonderful way to enjoy the home baked aroma and taste of Molasses cookies without all the hassle. About Betty Crocker® Molasses Cookie mix Love molasses cookies, but could do without the preparation and mess? Betty Crocker to the rescue! This fall, Betty Crocker is introducing a molasses cookie mix, making this year-round favorite easy to bake in less than 20 minutes. With a delectably soft and chewy texture, and great spice cookie taste, new Betty Crocker® Molasses Cookie mix combines real molasses flavor with hints of cinnamon and spice for a homemade taste that you’ll love. Look for Betty Crocker Molasses Cookie mix in the baking aisle of grocery stores this fall. These cookies are sooooo good. They are so soft and chewy, with just the right blend of spiciness and sweetness. 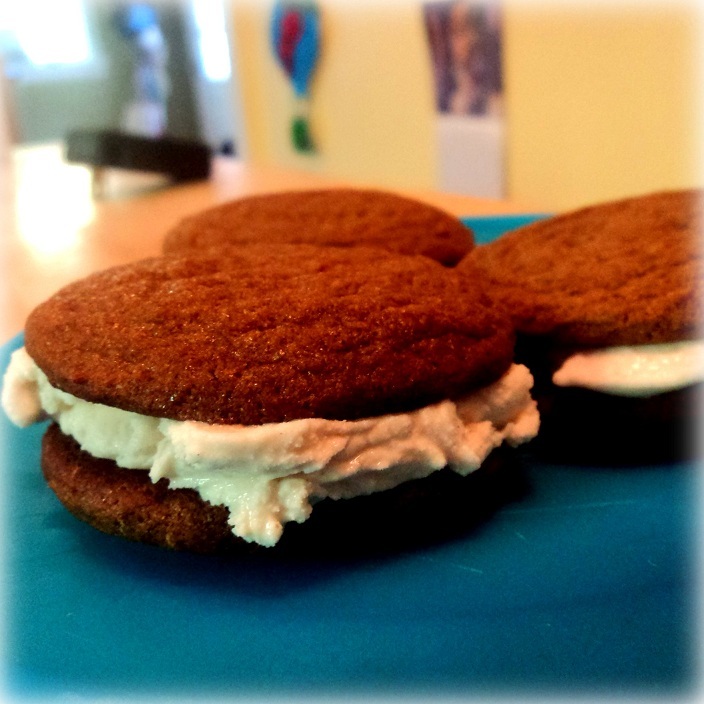 They're perfect on their own, with a glass of milk -- or best of all, in an ice-cream sandwich! That's how we've been enjoying the batch we made, using the Betty Crocker Molasses cookie mix that MyBlogSpark sent us to try. It was so easy to make, and the whole thing took about 20 minutes. * The recipe calls for a stick of softened butter. If you're like me and you forgot to take the butter out of the fridge, you can soften the butter in the microwave, on high, for 10 or 15 seconds. * Use an ice-cream scoop to portion out the cookie dough. It's quick and easy, and all your cookies turn out round and even in size! A mini ice-cream scoop is just right for making 2-inch molasses cookies. * Line your pans with parchment paper. The cookies will brown evenly at the bottom, they won't stick to your baking sheet, and clean-up is a breeze. Finally, the cookies will come out of the oven super-soft, so leave them on the pan for a couple of minutes before transferring them to cooling racks. Resist the temptation to eat them right away, because the center will be slightly raw. In addition, you and your readers can visit http://bit.ly/cookiescoupon to download a printable coupon for $0.75 off the purchase of one (1) Betty Crocker® Molasses Cookie mix pouch today! Molasses Cookie mix prize pack which includes a Betty Crocker apron, non-stick baking pan, and mixing spoon. Leave a comment on this post and share how you plan to use the time you've saved by using Betty Crocker Molasses Cookie mix. This entry must be completed before any extra entries will count. 3) Write on the Betty Crocker Facebook page and share your favorite occasion for baking Betty Crocker Molasses cookies (1 entry). 4) Add the Bonggamom Finds blog button to your sidebar (1 entry). 5) Follow Bonggamom Finds on Blogger/Google Friend Connect (1 entry). This giveaway ends at 11:59PM PST on October 7, 2011; I will draw a winner at random on October 8 and post the winner's name after he/she confirms acceptance. Continental US residents only. For additional giveaway rules, click here. Good luck! Disclosure: Product, information (in italics) and prize pack have been provided by Betty Crocker through MyBlogSpark. The views and opinions expressed here are my own. I'm going to take that extra time and spend it relaxing with my family!! I'd use the extra time to watch a movie w/ the family! I'd use it to take a power nap. Thanks. I will spend time with my son, we can take a nature walk. I'd use the extra time to play a board game with my daughter. I left the comment/link on Bonggamom Finds' FB wall under username Jennie Tilson. I left a comment on Betty Crocker's facebook wall under username Jennie Tilson. I will take that time and play with my kids. I entered the 8 oclock coffee giveaway. I entered the aerobie giveaway. I would use the extra time to play with my son! I would enjoy reading on my Kindle with the time I'll save by using Betty Crocker Molasses Cookie Mix :) *Thanks* for the giveaway! I'm going to use that extra time to clean the rest of my house. This way I will have a clean house when my son comes home from school and cookies to welcome him in! I plan to sit down and enjoy a good book! my extra time would probably be spent running kids to sports practice! I'd spend it reading! I never get to sit down and enjoy a book anymore, it seems! I will sit and enjoy the cookies afterwards with the time saved. I would love to make this at Christmas. With so much else to do, it would save time and no one has to know, lol. Congrats to the winner: #73, costana!